It is amazing how popular babywearing has become today and rightfully so. It keeps everyone happy - baby, mom, siblings. We are huge fans, my babies love when I wear them and I enjoy having them close when we bake, clean, and enjoy the outdoors. The convenience of having your hands free and your baby content makes the daily tasks of mothering much more manageable. We are excited to have partnered with Thanks Mama to give away the Onya Baby Carrier to one reader so that you and your little one can savor the joy and convenience of babywearing as well! In addition you will get $50 to spend on anything you please - cloth diapers, potty training pants, wooden toys, bedding, baby care items, or nursing essentials, to name a few. Thanks Mama online baby store features a selection of twelve baby carrier brands, among them the versatile Onya Baby Carrier. The unique feature that we love is that it doubles as a baby carrier and a baby seat for when you are out and about. It comes in beautiful, modern colors and two different materials. The soft cotton is suitable for most situations and climates and the rip-stop nylon with mesh lining is perfect for hot weather, hiking, and active outdoor enthusiasts. Purchase: You can purchase the Onya Baby Carrier at Thanks Mama. Use code CARRIER for 15% off! Win It! 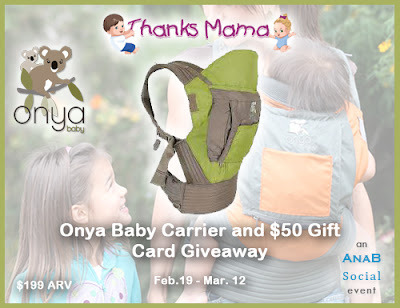 Thanks Mama is generously giving away the Onya Baby Carrier (winner's choice based on availability) and a $50 gift card to Thanks Mama store to one winner. Special thanks to AnaB Social for hosting this giveaway. 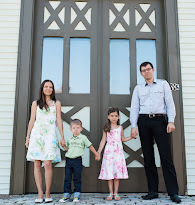 Huge thanks to Thanks Mama and all participating bloggers as well! Giveaway ends March 13th at 12:01 am, open WORLDWIDE, ages 18+. To enter please use the Rafflecopter form below (see directions on how to enter here). Thank you! Disclaimer: AnaB Social, Eco-Babyz, and all participating event bloggers are not responsible for sponsor prize shipment. May contain affiliate links that help support Eco-Babyz at no extra cost to you.